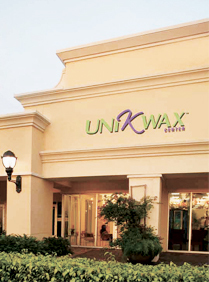 If you are looking for information on the Uni K Wax Center franchise business opportunity, UniKWax Center franchises or UKW franchising, then you have come to the right place. Ever since our beginnings in 1993, we have offered only waxing services, utilizing our proprietary techniques and exclusive products of the utmost quality. Our goal is to expand faster through franchising, while always maintaining the high quality of our products and services. The UKW franchise program gives more customers the chance to look and feel fantastic and it gives franchise owners the chance to operate their own professional business backed by our proven system. We hope you will join us in our quest to offer our customers the finest products and customer service; to offer these with the utmost professionalism, courtesy, and integrity; and to have everyone who visits our centers feel at home, therefore creating the premiere hair removal system. Uni K Wax Centers offer the very best waxing services for men and women with a proven system that combines everything a customer would want in a waxing hair removal experience. Every little detail has been thought out and tested for efficiency and efficacy, so that our franchisees can offer a smoother waxing experience to all of our customers. UKW believes that franchising is a community, comprised of franchisor, franchisees and their employees, and suppliers, each working together as a team. From the beginning, as you carefully follow our proven system and rules for success that pertain to owning a Uni K Wax Center franchise, you will enjoy the challenges of starting a new business as you apply your energy, enthusiasm, passion to providing the ultimate waxing experience to customers daily.